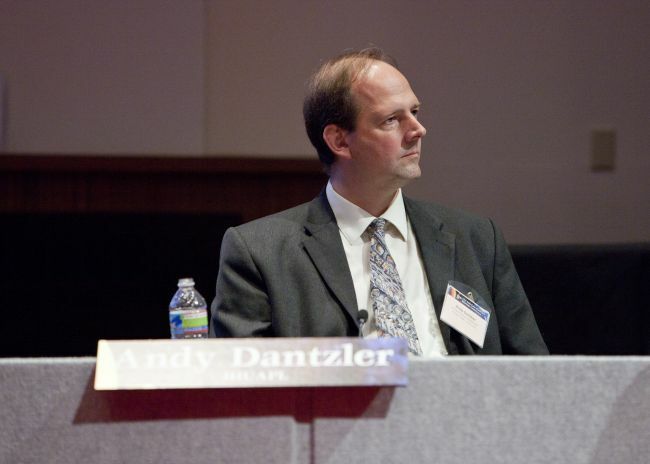 Patrick Hill of the Johns Hopkins Applied Physics Laboratory (APL) has been named the Parker Solar Probe project manager effective April 1, 2019. In this new role, he will be responsible for overall mission success and execution, including the collection and analysis of science data, sustained flight spacecraft engineering, and mission operations. 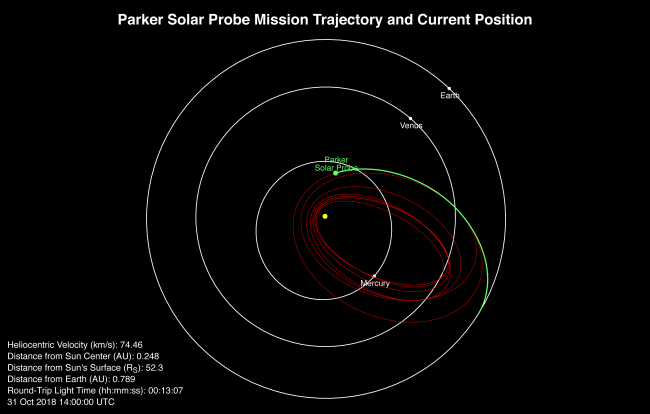 On March 30, 2019, Parker Solar Probe begins the second solar encounter phase of its mission, culminating in its closest approach to the Sun, called perihelion, on April 4. 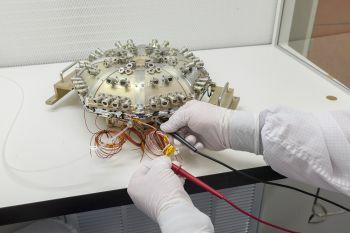 During this solar encounter phase, which lasts until April 10, the spacecraft's four suites of science instruments are fully operational and storing science data collected from within the Sun's corona. NASA’s Parker Solar Probe – humanity’s first mission to “touch” the Sun – was today named the innovation of the year by Popular Science. 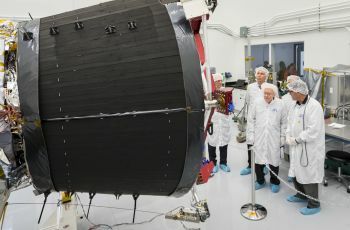 The revolutionary spacecraft – designed, built, and operated for NASA by the Johns Hopkins Applied Physics Laboratory in Laurel, Maryland – launched on August 12, 2018. Parker Solar Probe is alive and well after skimming by the Sun at just 15 million miles from our star's surface. This is far closer than any spacecraft has ever gone — the previous record was set by Helios B in 1976 and broken by Parker on Oct.
At about 10:28 p.m. EST on Nov. 5, Parker Solar Probe will achieve its first perihelion - its first close approach to the Sun - and will come within 15 million miles of the Sun's surface. 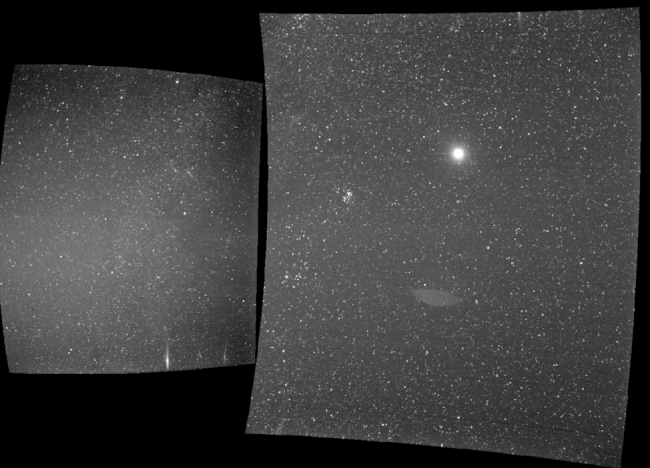 On Oct. 31, 2018, Parker Solar Probe began its first of 24 solar encounters. This period — which lasts until Nov. 11 — is the time during which the spacecraft is within 0.25 astronomical units, or 23.2 million miles, of the Sun's center. At about 10:54 p.m. EDT on Oct. 29, Parker Solar Probe surpassed 153,454 miles per hour — as calculated by the mission team — making it the fastest-ever human-made object relative to the Sun. 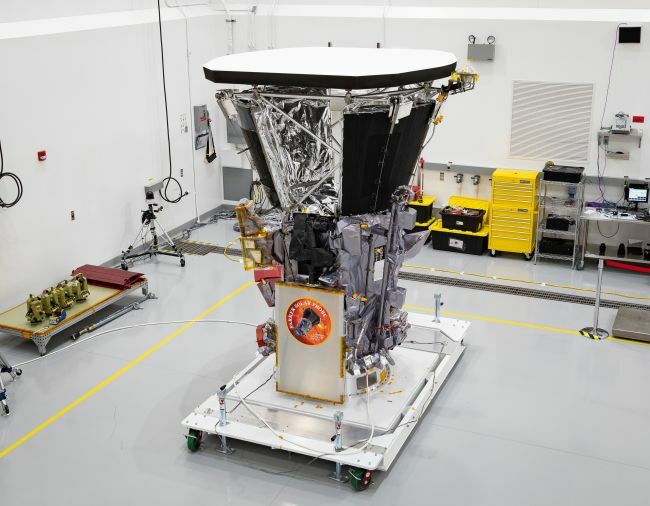 Parker Solar Probe now holds the record for closest approach to the Sun by a human-made object. 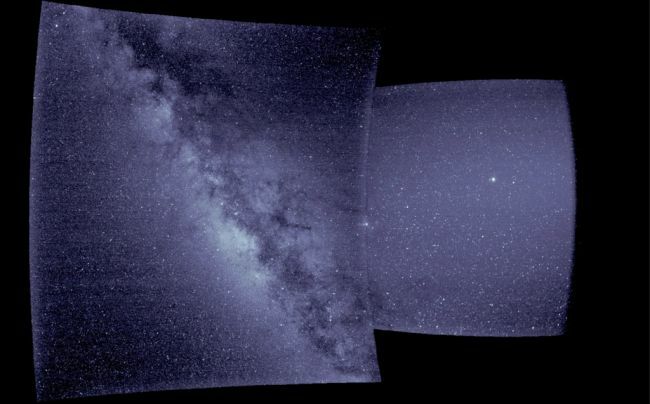 The spacecraft passed the current record of 26.55 million miles from the Sun's surface on Oct.
Two days after NASA’s Parker Solar Probe flew past Venus toward its rendezvous with the Sun, the spacecraft had drawn close enough to our star that its power-generating solar array wings began to tilt themselves inward – a task directed by the spacecraft itself, based on the rising temperatures – away from the Sun and behind the sun shield. On Oct. 3, 2018, Parker Solar Probe performed the first significant celestial maneuver of its seven-year mission. As the orbits of the spacecraft and Venus converged toward the same point, Parker Solar Probe slipped in front of the planet, allowing Venus' gravity — relatively small by celestial standards — to twist its path and change its speed. 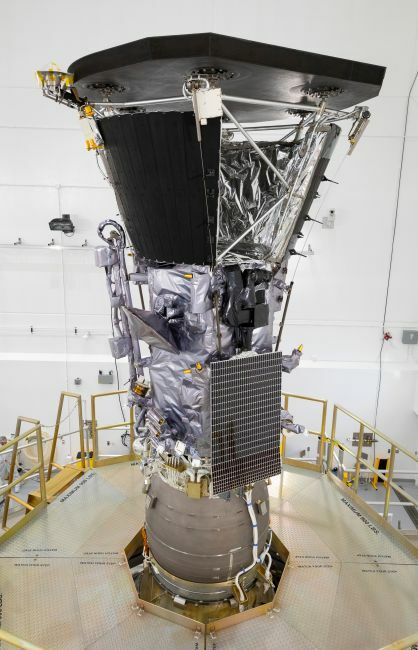 On Oct. 3, Parker Solar Probe successfully completed its flyby of Venus at a distance of about 1,500 miles during the first Venus gravity assist of the mission. 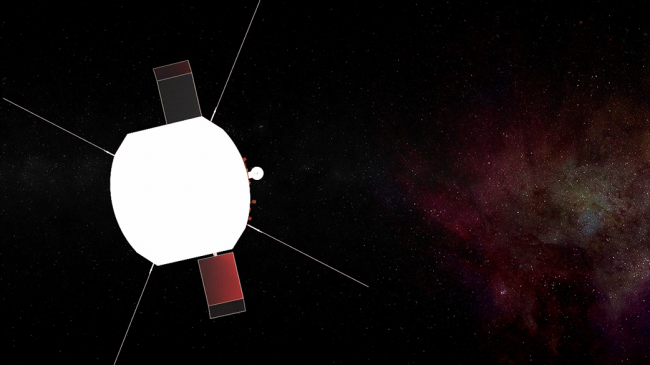 These gravity assists will help the spacecraft tighten its orbit closer and closer to the Sun over the course of the mission.Detailed data from the flyby will be assessed over the next few days. 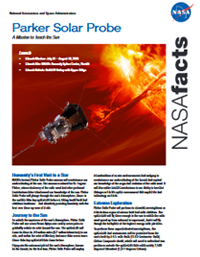 As Parker Solar Probe – named for pioneering solar scientist Eugene Parker – rose from Launch Complex 37 at Cape Canaveral Air Force Station into the skies above Florida in the early morning hours of Aug.
On Sept. 13, Parker Solar Probe's first-of-its-kind water-cooled Solar Array Cooling System (or SACS) was made fully operational. 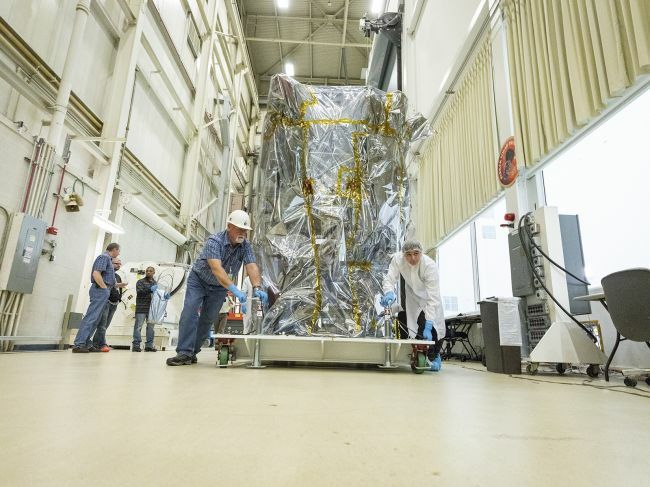 The SACS will protect Parker Solar Probe’s solar arrays — responsible for powering the spacecraft — from the intense heat of the Sun. 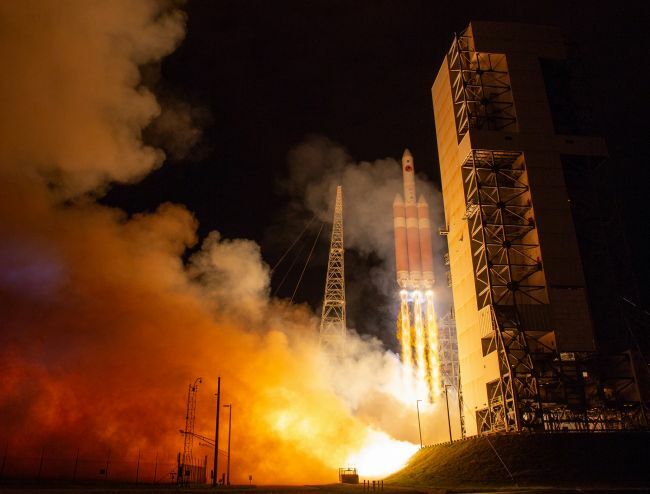 Watch in 360 degrees as Parker Solar Probe launches aboard a Delta IV Heavy rocket lifts off from Space Launch Complex-37 at Cape Canaveral Air Force Station in Florida. The spacecraft lifted off at 3:31 a.m.
Where's Parker Solar Probe? Track the Spacecraft! 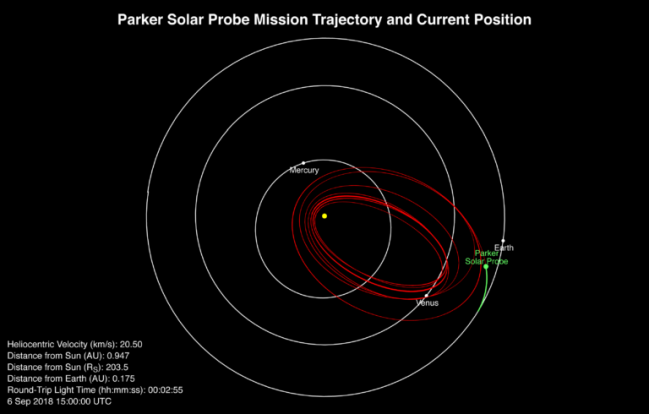 You can now track the position and speed of Parker Solar Probe on the web: http://parkersolarprobe.jhuapl.edu/The-Mission/index.php#Where-Is-PSP The plots showing the spacecraft’s heliocentric velocity, distances from the Sun and Earth, and round-trip light time to Earth update every hour. 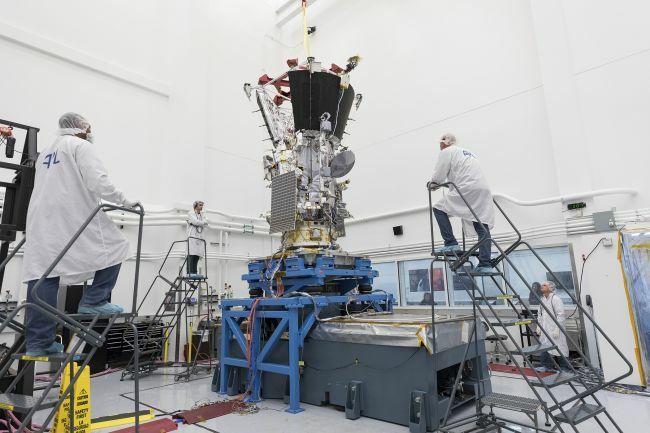 Parker Solar Probe continues to bring its instruments and secondary systems online — slightly ahead of schedule — as it speeds away from Earth. 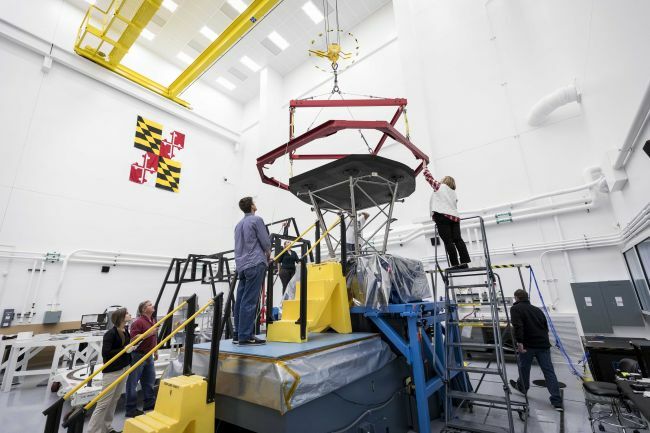 On Friday, Aug. 31, flight controllers at the Johns Hopkins Applied Physics Laboratory in Laurel, Maryland performed a second planned Trajectory Correction Maneuver (TCM-2), a thruster burn which lasted for 35.2 seconds. 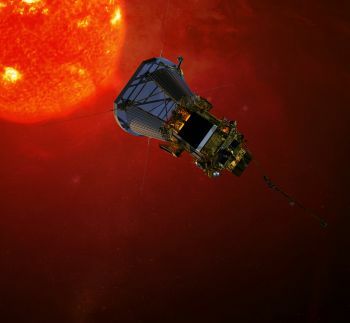 At 6:07 a.m. EDT on Aug. 20, 2018, NASA’s Parker Solar Probe successfully completed its first trajectory correction maneuver (known as TCM-1), achieving a near-perfect firing of its propulsion system and putting the spacecraft on course to “touch” the Sun. 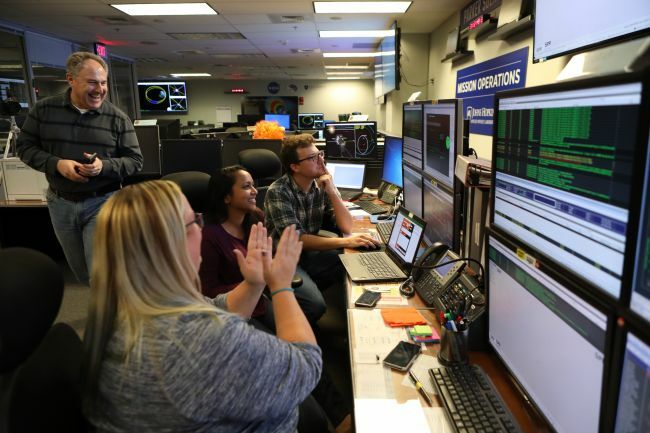 Just two days after launch on Aug. 12, 2018, from Cape Canaveral Air Force Station in Florida, NASA’s Parker Solar Probe achieved several planned milestones toward full commissioning and operations, announced mission controllers at the Johns Hopkins Applied Physics Laboratory, or APL, in Laurel, Maryland. 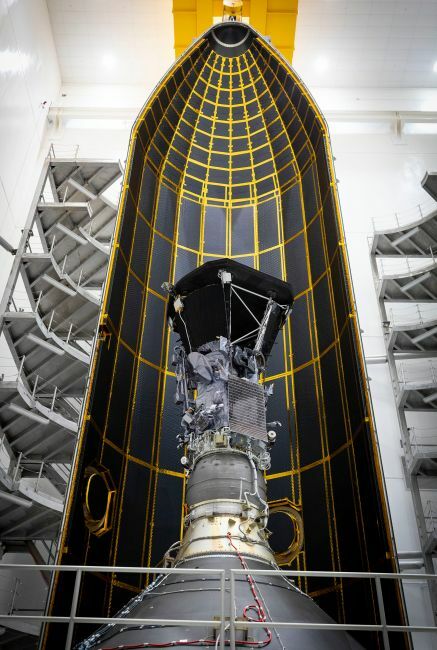 Hours before the rise of the very star it will study, NASA’s Parker Solar Probe launched from Florida Sunday, Aug. 12 to begin its journey to the Sun, where it will undertake a landmark mission. 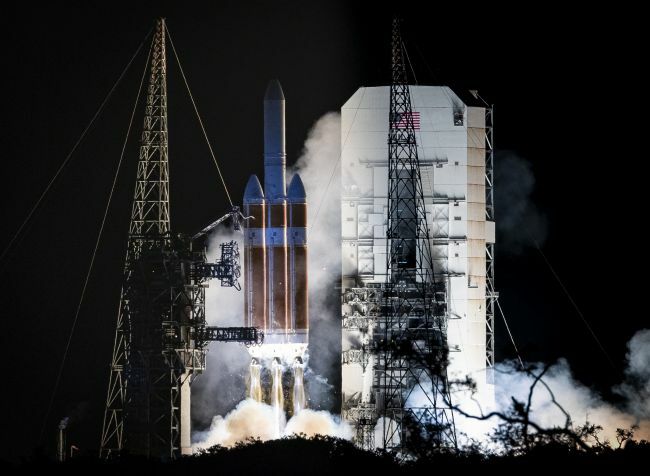 The launch of a United Launch Alliance Delta IV Heavy carrying the Parker Solar Probe spacecraft was scrubbed today due to a violation of a launch limit, resulting in a hold. There was not enough time remaining in the window to recycle. The launch team is targeting 3:53 a.m. EDT for liftoff of the United Launch Alliance Delta IV Heavy rocket carrying NASA's Parker Solar Probe. 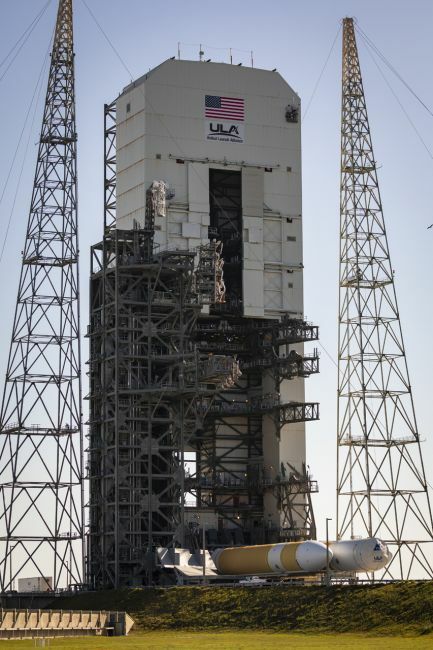 The countdown is in progress at Cape Canaveral Air Force Station's Space Launch Complex 37. 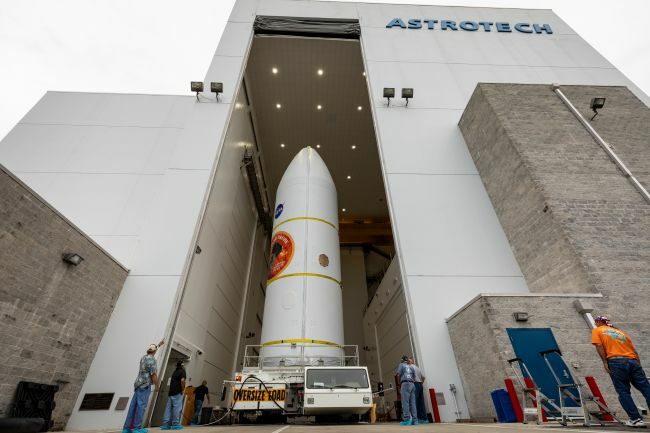 NASA’s Parker Solar Probe, secured inside its payload fairing, was moved July 30, 2018, from nearby Astrotech Space Operations in Titusville, Florida, to Space Launch Complex 37 on Cape Canaveral Air Force Station. 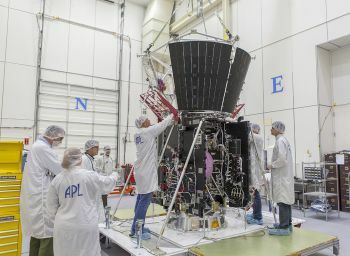 Teams preparing for launch of NASA’s Parker Solar Probe are beginning a busy week leading up to liftoff, scheduled for Saturday, Aug. 11, at 3:33 a.m. EDT, the opening of a 65-minute window. 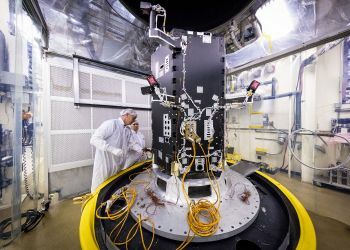 NASA and its mission partners have analyzed and approved an extended launch window for Parker Solar Probe until Aug. 23, 2018 (previously Aug. 19). 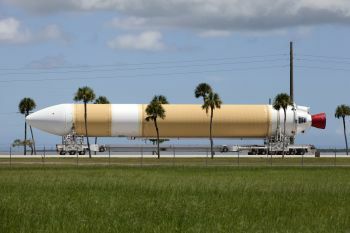 The spacecraft is scheduled to launch no earlier than Aug. Even though our Sun shines bright in the sky, it is shrouded in mystery. In this episode of NASA's Rocket Ranch podcast, we hear from Parker Solar Probe project scientist Nicky Fox, who explains how the mission will fly inside the Sun's atmosphere in order to unlock its many secrets. Take a tour of the Integrated Science Investigation of the Sun—IS☉IS, pronounced ee-sis and including the symbol for the Sun in its acronym—on board Parker Solar Probe with Principal Investigator David McComas. 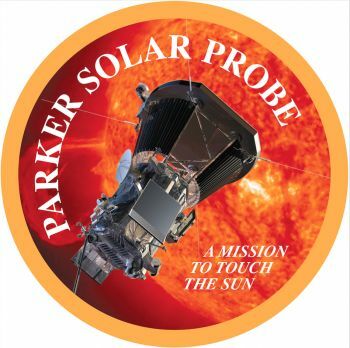 NASA and its mission partners are targeting Aug. 11 for the launch of the Parker Solar Probe mission to the Sun. The 45-minute launch window will open at 3:48 a.m. EDT. During final inspections following the encapsulation of the spacecraft, a small strip of foam was found inside the fairing and additional time is needed for inspection. 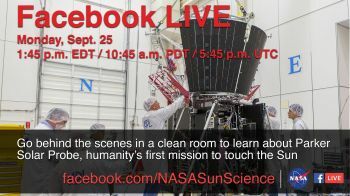 NASA will hold a preview briefing on the agency’s Parker Solar Probe at 1 p.m. EDT Friday, July 20. The event will air live on NASA Television, the agency’s website and Facebook Live. 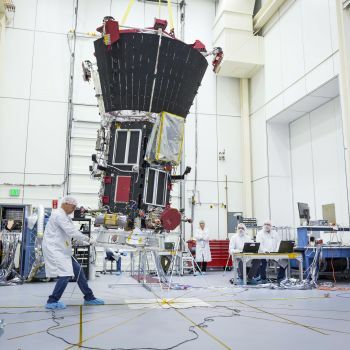 NASA now is targeting launch of the Parker Solar Probe no earlier than Aug. 6, 2018. Additional time was needed to evaluate the configuration of a cable clamp on the payload fairing. 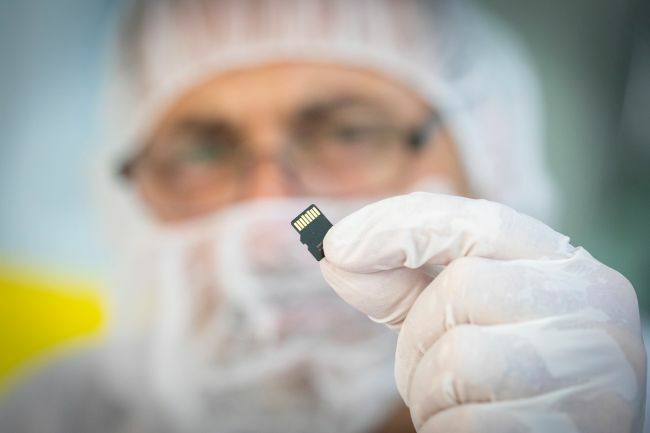 NASA and the Johns Hopkins University Applied Physics Laboratory are now targeting launch of the agency’s Parker Solar Probe spacecraft no earlier than Aug. 4, 2018. 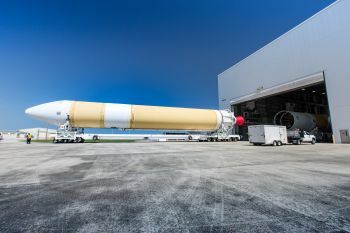 Originally scheduled to launch on July 31, additional time is needed to accommodate further software testing of spacecraft systems. 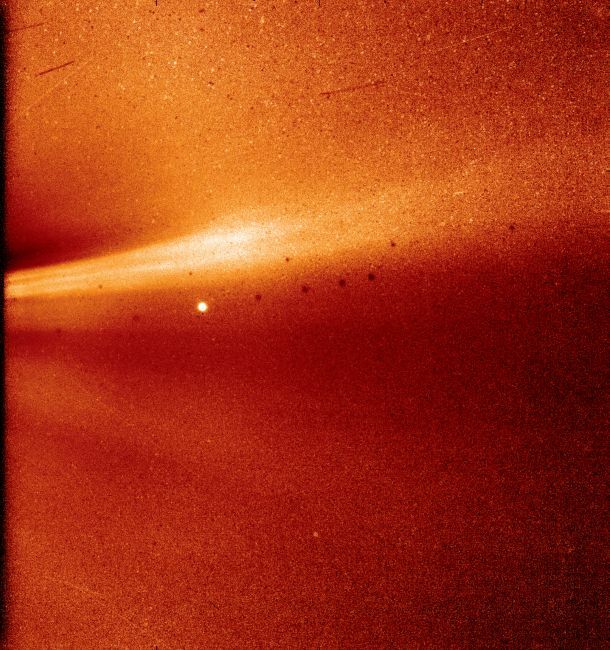 NASA’s Parker Solar Probe depends on the Sun, not just as an object of scientific investigation, but also for the power that drives its instruments and systems. 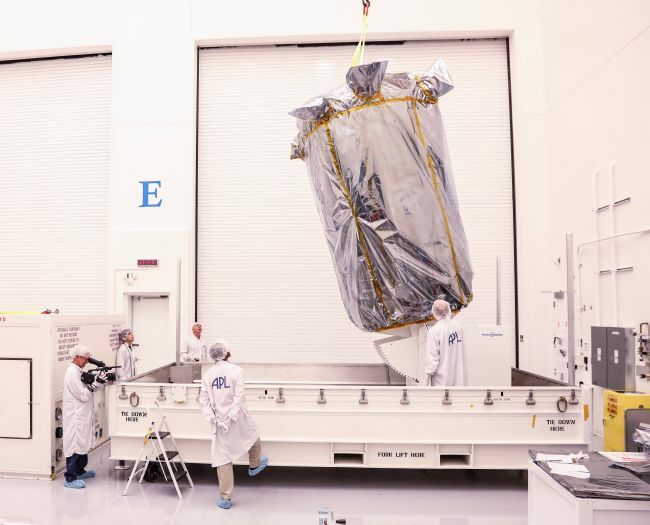 On Thursday, May 31, 2018, the spacecraft’s solar arrays were installed and tested. 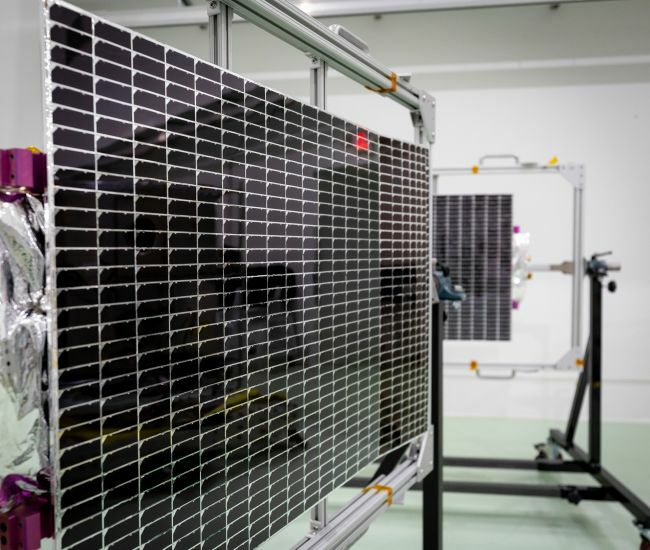 NASA’s Parker Solar Probe gets its power from the Sun, so the solar arrays that collect energy from our star need to be in perfect working order. 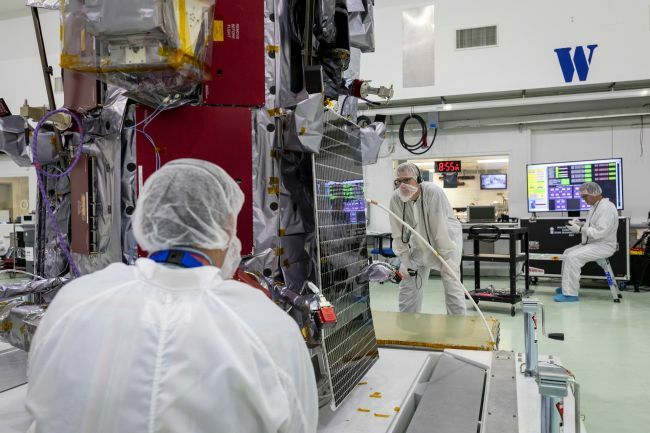 This month, members of the mission team tested the arrays at Astrotech Space Operations in Titusville, Florida, to ensure the system performs as designed and provides power to the spacecraft during its historic mission to the Sun. NASA’s Parker Solar Probe will carry 1,137,202 submitted and confirmed names on its journey to the Sun. Submissions opened on March 6, 2018, and closed on April 27 at 11:59 p.m. EDT. 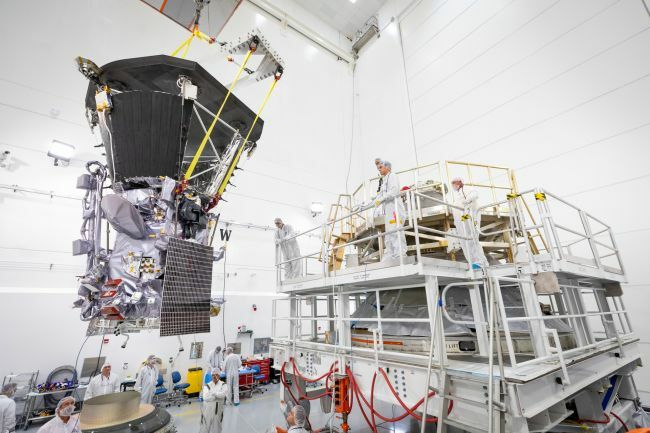 NASA’s Parker Solar Probe is moved to a special stand and rotated down to a horizontal position on April 10 during pre-launch processing and testing at Astrotech Space Operations in Titusville, Florida, just outside Kennedy Space Center. On the morning of Tuesday, April 17, 2018, crews from United Launch Alliance raised the 170-foot tall Delta IV Heavy launch vehicle – the largest and most powerful rocket currently used by NASA – at Launch Complex 37 at Cape Canaveral Air Force Station in Florida. 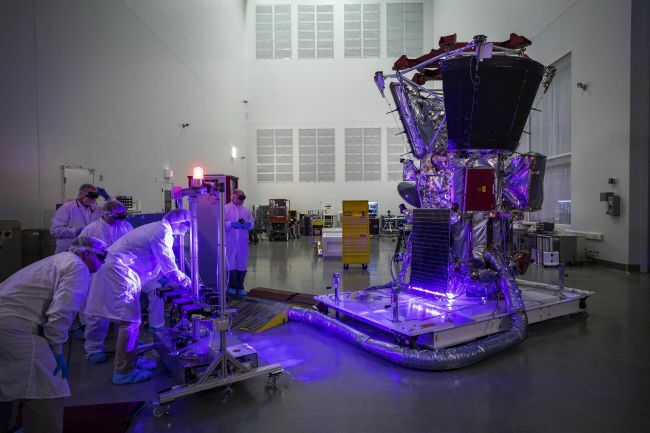 NASA’s Parker Solar Probe has arrived in Florida to begin final preparations for its launch to the Sun, scheduled for July 31, 2018. 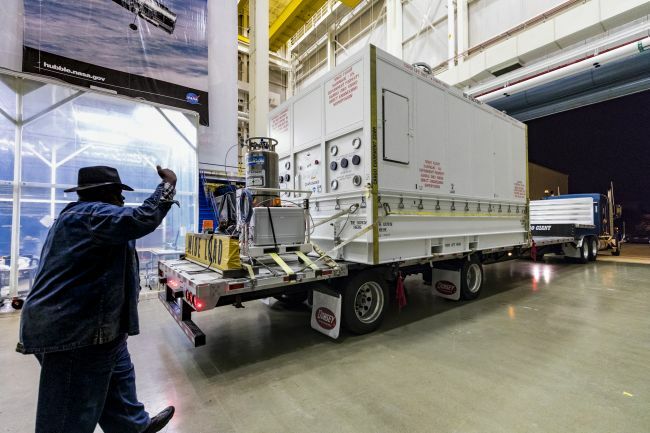 In the middle of the night on April 2, the spacecraft was driven from NASA’s Goddard Space Flight Center in Greenbelt, Maryland, to nearby Joint Base Andrews in Maryland. 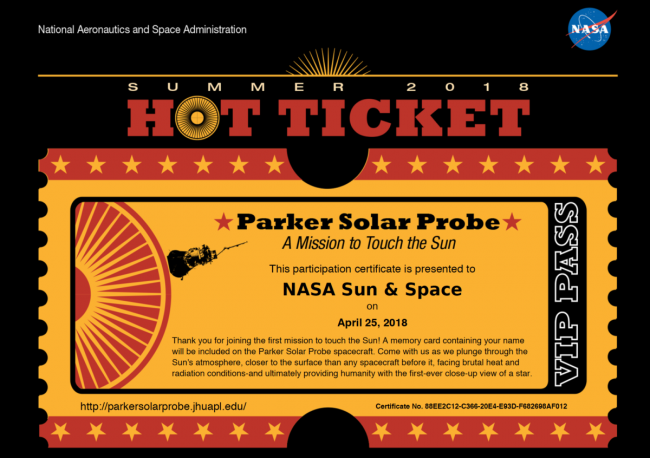 Want to get the hottest ticket this summer without standing in line?NASA is inviting people around the world to submit their names online to be placed on a microchip aboard NASA’s historic Parker Solar Probe mission launching in summer 2018. 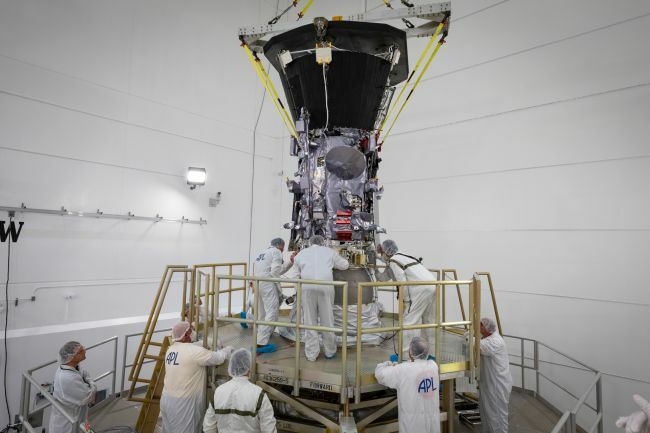 On Saturday, Jan. 27, NASA’s Parker Solar Probe began space environment testing, starting with the air being pumped out of the 40-foot-tall thermal vacuum chamber at NASA’s Goddard Space Flight Center in Greenbelt, Maryland where the spacecraft is currently housed. 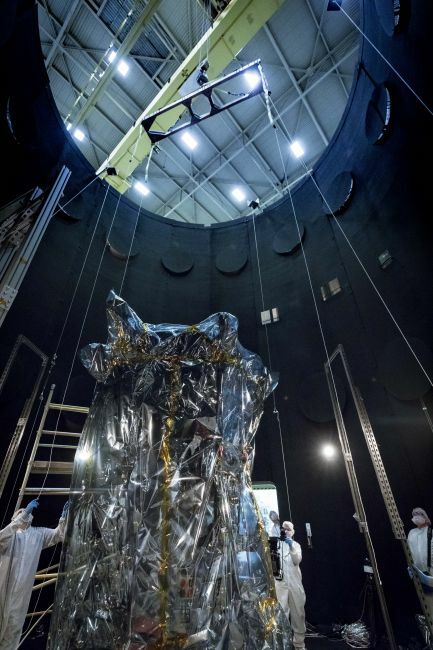 On Wednesday, Jan. 17, NASA’s Parker Solar Probe was lowered into the 40-foot-tall thermal vacuum chamber at NASA’s Goddard Space Flight Center in Greenbelt, Maryland. 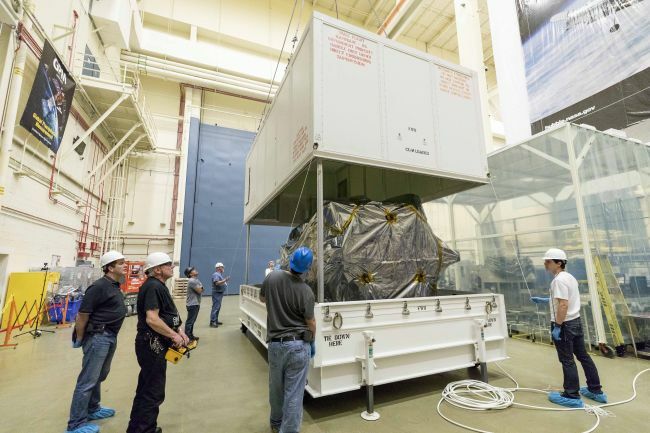 The spacecraft will remain in the chamber for about seven weeks, coming out in mid-March for final tests and packing before heading to Florida. Watch this presentation on how NASA’s Parker Solar Probe and ESA’s Solar Orbiter missions will study the Sun separately and combine their science findings to give us an unprecedented understanding of our star. 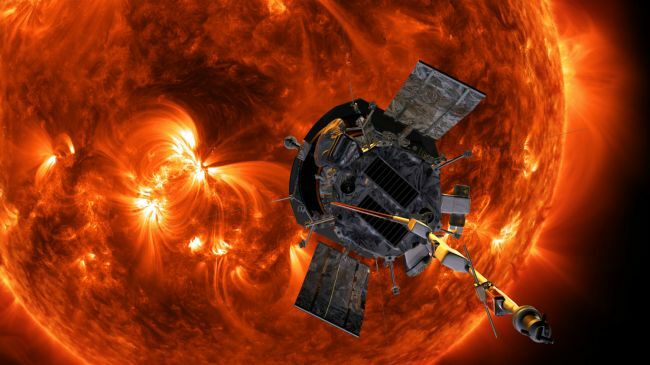 How do you prepare to move the first spacecraft to touch the Sun? Same way you would move anything else: carefully wrap it, pack it in a large container, and perform a nitrogen purge. 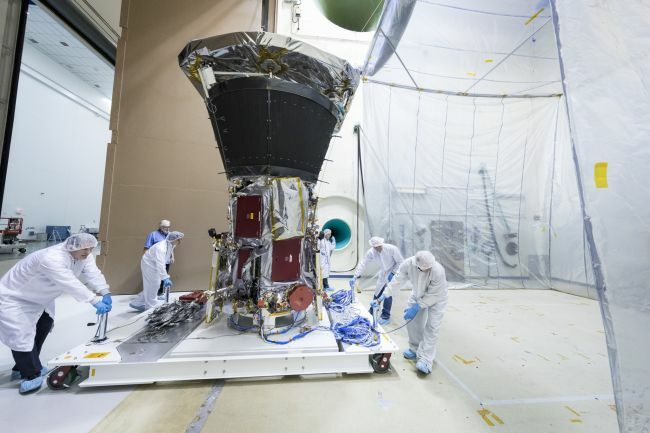 To protect NASA's Parker Solar Probe from the intense heat of the Sun's atmosphere, scientists and engineers developed a revolutionary Thermal Protection System, or TPS. 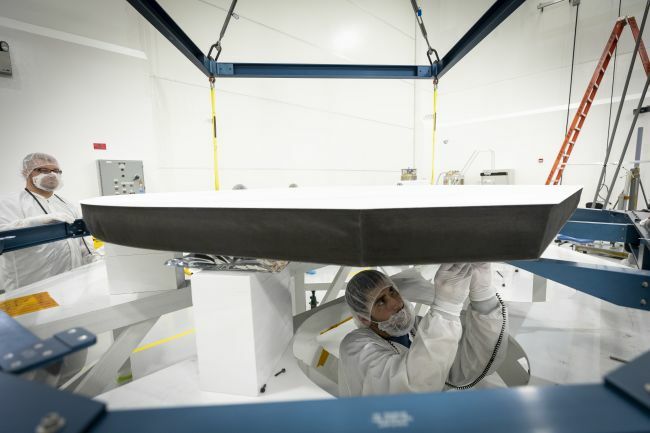 This heat shield, made of carbon-carbon composite material, will experience temperatures of almost 2,500 degrees Fahrenheit (1,370 Celsius) as the spacecraft hurtles through the solar atmosphere, while keeping the instruments on the spacecraft at approximately room temperature.The heat shield recently moved from the Johns Hopkins Applied Physics Lab (APL) in Laurel, Maryland to NASA’s Goddard Space Flight Center in Greenbelt to undergo testing in their large Thermal Vacuum Chamber. 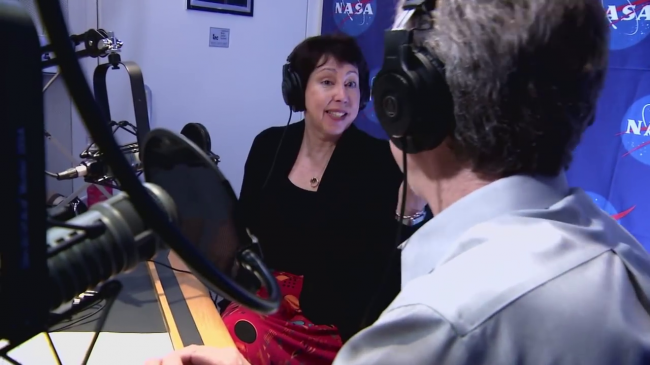 “Gravity Assist,” a new NASA weekly podcast series, launches Wednesday on NASA.gov and the SoundCloud and iTunes audio platforms. This initial 10-part series, with plans for future episodes, features top scientists from around the world guiding listeners on a tour through our galactic neighborhood as they explore the wonders of the solar system and beyond. 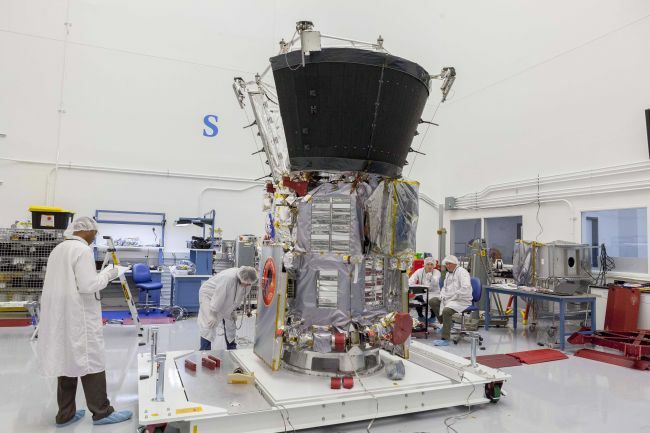 On Monday, November 6, NASA's Parker Solar Probe spacecraft arrived at the NASA Goddard Space Flight Center in Greenbelt, Maryland - a short drive from the Johns Hopkins Applied Physics Laboratory in Laurel, Maryland, where the spacecraft was designed and built. 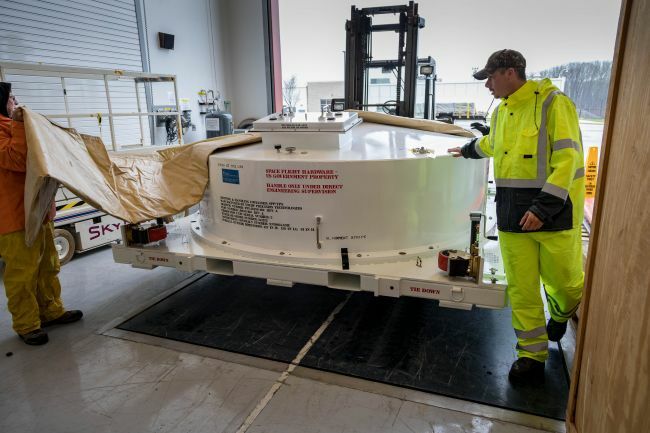 NASA’s Parker Solar Probe – shown in protective bagging to prevent contamination, and mounted on a rotating pedestal – is getting ready for its trip from the Johns Hopkins Applied Physics Lab to Goddard Space Flight Center to continue environmental testing. 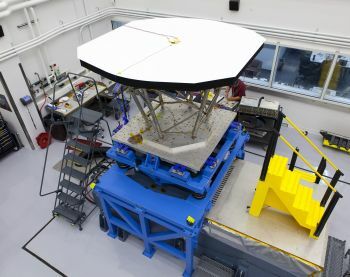 To ensure that NASA's Parker Solar Probe will be able to withstand the physical stresses of launch, engineers at the Johns Hopkins Applied Physics Laboratory – where the probe was designed and is being integrated and tested – used a special device called a shaker table to simulate the forces of being hurled into space. 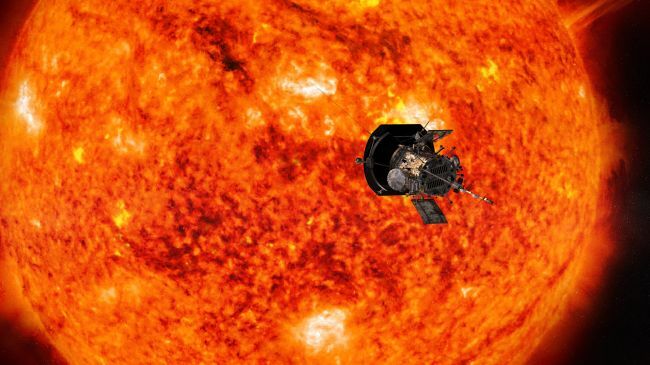 NASA’s Parker Solar Probe, the first mission to fly into the Sun’s corona, has successfully completed a review that approves the beginning of the spacecraft’s environmental testing. 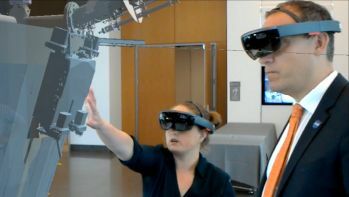 New augmented reality technology developed by NASA allows the Parker Solar Probe spacecraft team to explore, rehearse, and perfect their fabrication and integration procedures—all in an immersive digital environment. 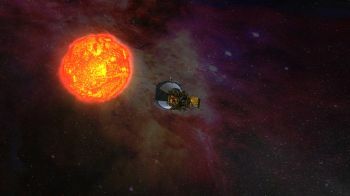 As NASA’s Parker Solar Probe spacecraft begins its first historic encounter with the sun’s corona in late 2018—flying closer to our star than any other mission in history—a revolutionary cooling system will keep its solar arrays at peak performance, even in extremely hostile conditions.Every instrument and system on board Parker Solar Probe (with the exception of four antennas and a special particle detector) will be hidden from the sun behind a breakthrough thermal protection system (TPS)—an eight-foot diameter shield that the spacecraft uses to defend itself against the intense heat and energy of our star. 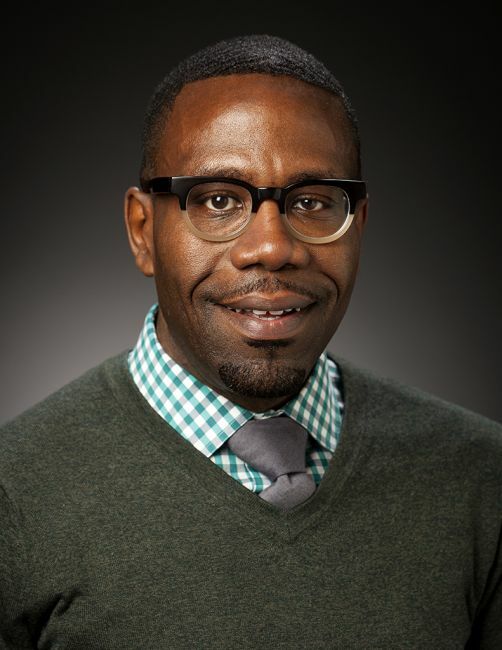 CHICAGO – NASA has renamed the Solar Probe Plus spacecraft – humanity’s first mission to a star, which will launch in 2018 – as the Parker Solar Probe in honor of astrophysicist Eugene Parker. NASA will make an announcement about the agency’s first mission to fly directly into our sun’s atmosphere during an event at 11 a.m. EDT Wednesday, May 31, from the University of Chicago’s William Eckhardt Research Center Auditorium. 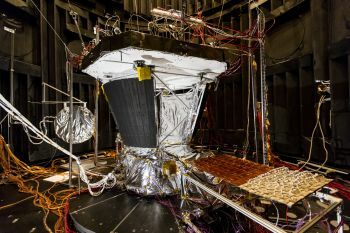 With a few electrical connections and several turns of a wrench, Solar Probe Plus had its first onboard scientific instrument. 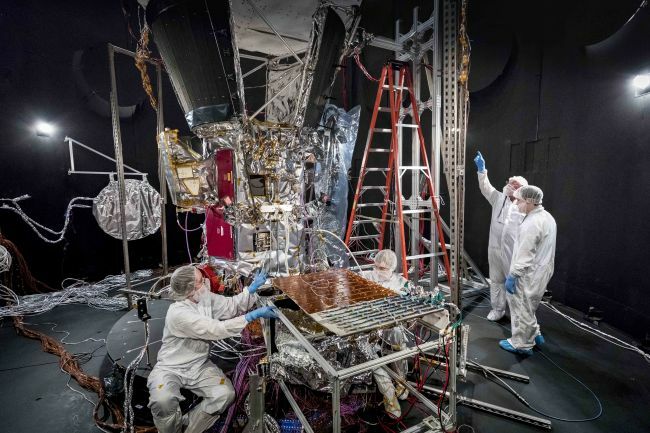 The EPI-Lo particle detector – half of the Integrated Science Investigation of the Sun instrument suite – was installed on the spacecraft on April 17 at the Johns Hopkins Applied Physics Laboratory (APL) in Laurel, Maryland. 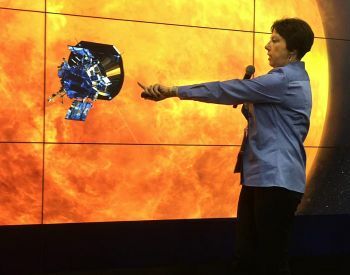 Solar Probe Plus Project Scientist Nicky Fox, of the Johns Hopkins University Applied Physics Laboratory (APL), was featured in a Discovery Channel Facebook Live event on Feb. 8, 2017. 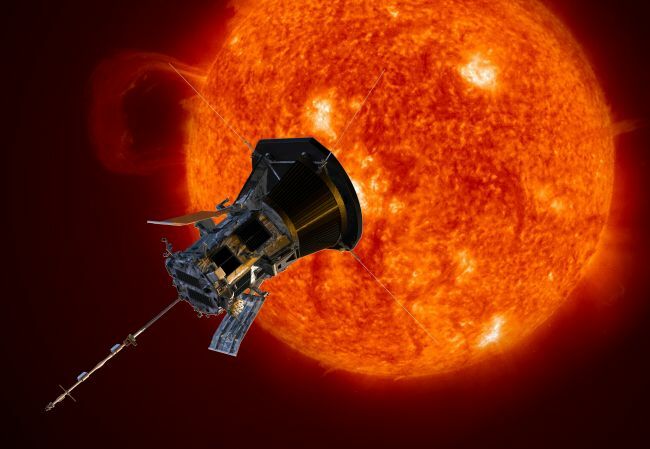 The science of Solar Probe Plus – NASA’s first mission to “touch” the sun – was on stage last month at the American Geophysical Union’s Fall Meeting in San Francisco. With some 25,000 attendees, representing nearly 100 countries, AGU’s Fall Meeting is the world’s largest Earth and space science conference. 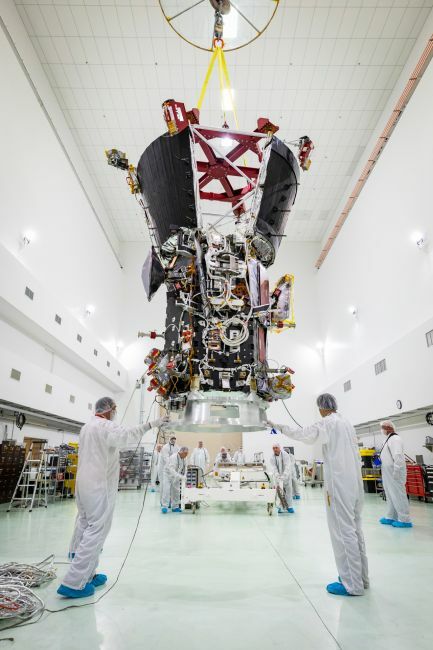 Solar Probe Plus — NASA’s ambitious mission to fly through and examine the sun’s atmosphere — has reached a key stage of development. 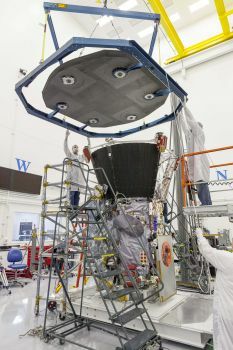 Solar Probe Plus will begin advanced design, development and testing — a step NASA designates as Phase C — following a successful design review in which an independent assessment board deemed that the mission team, led by the Johns Hopkins University Applied Physics Laboratory (APL) in Laurel, Md., was ready to move ahead with full-scale spacecraft fabrication, assembly, integration and testing. Join the Parker Solar Probe eNews list to receive updates about the mission. 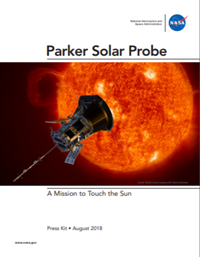 If you no longer wish to receive Parker Solar Probe E-News, please click here to be taken to the unsubscribe page.